FBI: Crime Decreasing In Constitutional Carry States! Even the government and anti-gunners must admit we’re right. Despite all the hand wringing by nanny staters like Michael Bloomberg, crime is actually decreasing in Constitutional Carry states. We all remember the gloom and doom predictions we heard several weeks ago at our own Constitutional Carry hearing. All lies and complete hyperbole. Don’t take our word for it, take a look at the recent report published by the FBI! Not only does common sense tell you that these scenarios are not playing out — but statistics also show that in Constitutional Carry states, crime is decreasing. Bloomberg and his anti-gun front groups have predicted bad results in every state that has passed it. None of them have come true. You see, what they don’t want the public to know is that no matter what laws are passed, criminals aren’t going to follow them. Only law-abiding citizens are going to follow the laws and as a result, only law-abiding citizens are hurt by their gun control laws. What the anti-gunners don’t want you to know is that Constitutional Carry changes everything. It changes the status quo and arms potential victims. Criminals have to decide who is armed. Constitutional Carry doesn’t care about the color of your skin, how poor or rich you are, how educated you are, or what background you come from. EVERYONE is equal and everyone can defend their life. If the government is in charge of your gun rights, criminals know there is a chance they can rob you without you being armed. With Constitutional Carry, they know it is a much bigger risk to attack a potential victim. That’s why we are pushing it here in Wisconsin. Senate Bill 169 will restore the right to bear arms in the State of Wisconsin as it used to be and as it was intended by our forefathers. We have had our first public hearing, nine hours of grueling testimony for and against Senate Bill 169. Bloomberg’s minions were out in full force, and they still are! They are now trying to stop Senate Bill 169 from ever getting an Executive Session, which is the committee vote that we need to move it forward. That vote could come any day now. This bill must get a vote in committee, and your calls and emails are crucial to making that happen. >>> Once you have contacted the committee, please get on our Facebook page and “Like” it right away. Our quickest updates come through social media and following us on Facebook is essential. If you already follow us, then please invite your friends to do the same. >>> Finally, we need everyone’s help to mobilize gun owners across Wisconsin, and you are the key to helping us do that! Whether you can do $500, $250, or $100 towards this mobilization effort, it is all appreciated. Donate here today! If that is simply too much right now, we understand. If you can pitch in $50 or even just $25 today then it all helps us mobilize gun owners to fight back against Bloomberg. Your efforts are crucial to the gun rights fight in Wisconsin. Thank you in advance for all that you do! P.S. The F.B.I. has now confirmed what gun owners already know — more guns in the hands of law-abiding citizens saves lives and decreases crime. 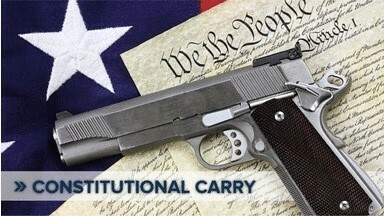 Despite the “sky is falling” predictions from Bloomberg and his anti-gun front groups, Constitutional Carry states are seeing a decrease in crime, according to the F.B.I. It’s our turn to move this gun rights battle forward. But we need you to reach out to the Judiciary and Public Safety Committee and demand an Executive Session right away to vote on moving Senate Bill 169 forward with no weakening amendments. Their contact information can be found above. Finally, if you can pitch in $500, $250, or $100 today to mobilize gun owners to fight for Constitutional Carry, it would be greatly appreciated. If that is too much right now, then please consider a smaller donation of $50 or $25 to help with the mobilization effort. Milwaukee Police Chief Blames You!